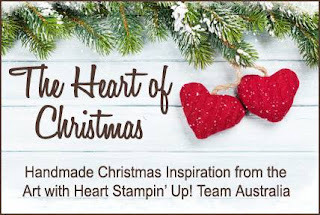 Hi everyone and welcome to week 25 of Christmas inspiration with Art with Heart Stampin'Up! Team Australia. Todays card base is Fresh Fig, for the top mat I used Whisper White. 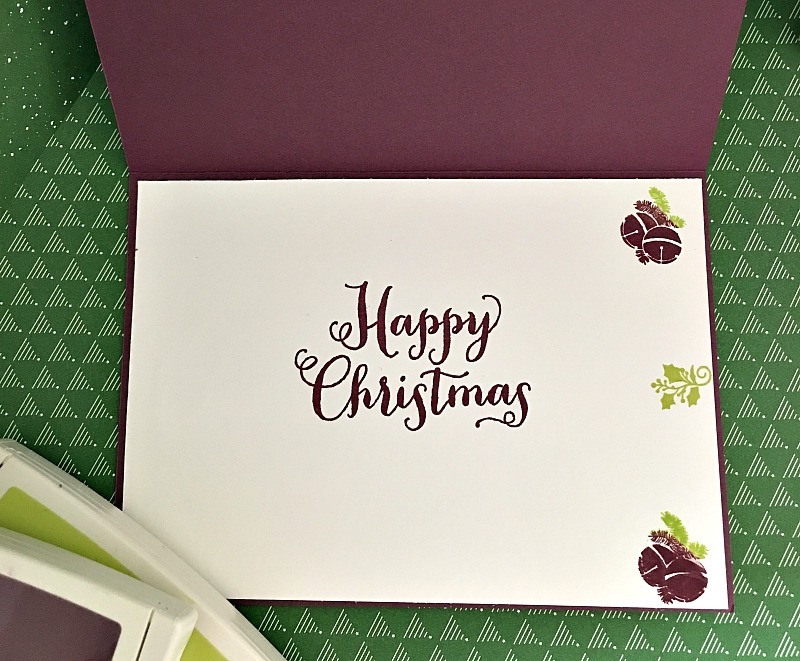 I did use a few different stamp sets with this card, the first one was the Holly Berry which I stamped in Fresh Fig that is from Father Christmas Stamp set, I then used the two snowflakes from the Colourful Season stamp set and I used Lemon Lime Twist and Crumb Cake, I stamped off once with each colour first, after the stamping I ran it through the big shot using the Holly Embossing folder. I cut the largest circle from the Stitched Framlits set in the Gold Glimmer Paper. 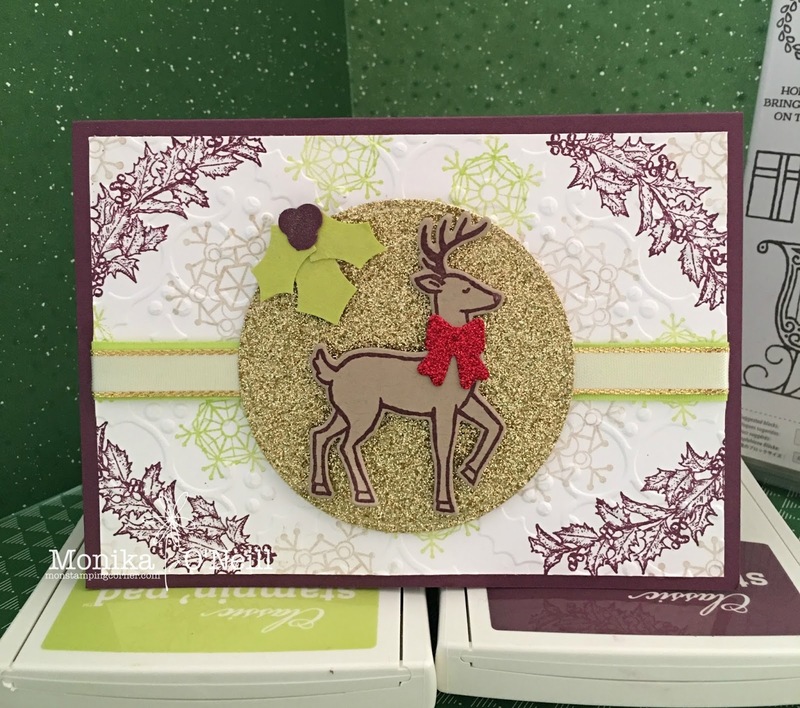 The reindeer is stamped onto Crumb Cake card stock using Fresh Fig and the bow from Red Glimmer paper both framelits are from the Santas sleigh. The Holly Leaves and Berries are Lemon Lime Twist and Fresh Fig Card stock and I used the Holly Berry Builder Punch. The ribbons are Lemon Lime Twist and Gold Metallic Edge. For the Sentiment inside the card, bells and Holly leaves are all from the Oh What Fun Stamp set, this is one of my favourites. Hope you enjoyed this weeks card. To see more beautiful inspiration from our very talented ladies you can view all our participants on the lovely Claire's blog. Have a great week and will see you again next week with some more great cards.